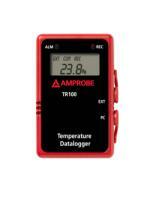 Product Description: Amprobes Model TR200-A takes both temperature and relative humidity readings in one compact size unit. Use the included Amprobe software for recording measurements to your personal computer. Set up these parameters for recording: Sample interval timing, Start/Stop, Date and Time, HI/LO Alarm Threshold, Unit Selection, and number of Memory points.